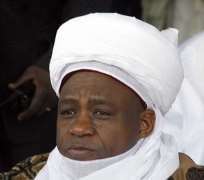 The Sultan of Sokoto Alhaji Sa'adu Abubakar has warned Nigerians to desist from making inciting comments on the current sectarian crisis in some northern states to avoid aggravating the situation. The Sultan gave the warning when he led northern traditional rulers to a meeting with their South-Eastern counterparts in Owerri yesterday. Condemning the crisis in the North, the Sultan said any defamatory comment in any part of the country could be misinterpreted and lead to break down of law and order. He said the current crisis was among Muslims, and regretted that some youths had attacked filling stations without any cause. He said the crisis was not unconnected with some politicians who may have recruited youths to unleash terror on people. On the current strike action by the Academic Staff Union of Universities (ASUU) the Sultan regretted that it had paralyzed academic activities in tertiary institutions across the country. He warned that if nothing was urgently done the situation might continue and Nigerian children in the various universities would be affected academically and socially. He appealed to the traditional rulers to intervene and assist both government and ASUU to resolve the lingering problem before it is too late. The chairman, South East and Imo State Council of Traditional Rulers Eze Cletus Ilomuany in his address stated the need for the cooperation of all Nigerians to ensure unity across the country.